It’s difficult to call the response to Apple’s iPhone X tepid considering the phone has made three times more money than every major Android vendor combined. But at least a half-dozen reliable independent reports at this point have said that Apple cut iPhone X manufacturing and parts orders multiple times since the phone was released last November. Tens of millions of iPhone X units have been sold at this point, but estimates are still far below analyst expectations, and they’re apparently well short of Apple’s expectations, too. The sky-high price tag, which starts at $1,000, is undoubtedly a factor. Another factor could be anticipation of this year’s iPhone launches, which will reportedly include a lower-cost version of the iPhone X and an “iPhone X Plus” with a larger OLED display. For those reasons and more, Apple’s 2018 flagship iPhone launches are eagerly anticipated by Apple fans around the world. The bad news is they’ll all have to wait until September to get their hands on Apple’s iPhone X successors, including the less expensive version and the larger iPhone X Plus. But the good news is Apple supposedly has a fourth new iPhone model planned for release this year, and it could hit store shelves as soon as next month. Apple uses an annual upgrade cycle for its flagship iPhone models, and that same upgrade cycle will likely apply to the new third iPhone Apple unveils this coming September. This new model is expected to feature the same general design as the iPhone X, but it’ll supposedly be less expensive thanks to an LCD display in place of the iPhone X’s pricey OLED screen. It also won’t support 3D Touch, and it may feature an aluminum midframe rather than stainless steel. Unfortunately, rumors suggest all those downgrades won’t save end users much money at all — the phone is expected to start at $799, while the next-generation iPhone X will apparently drop to $899. If it’s a less expensive iPhone you’re after, though, you might get what you’re looking for as soon as next month. According to regulatory filings made public this week, Apple’s updated iPhone SE might finally be released as soon as next month. French Apple blog Consomac discovered the filings in the Eurasian Economic Commission database. The EEC has revealed new upcoming iPhone model numbers several times in the past, and they’re typically posted on the site about a month before they’re announced and released to the public. In this case, a whopping 11 different iPhone model numbers have appeared in the database, and none of them correspond to any currently available iPhone models. The newly listed models are as follows: A1920, A1921, A1984, A2097, A2098, A2099, A2101, A2103, A2104, A2105, and A2106. It’s likely that all of these model numbers refer to different variants of the same iPhone, but all we know for the time being is that this mysterious unreleased handset runs iOS 11. 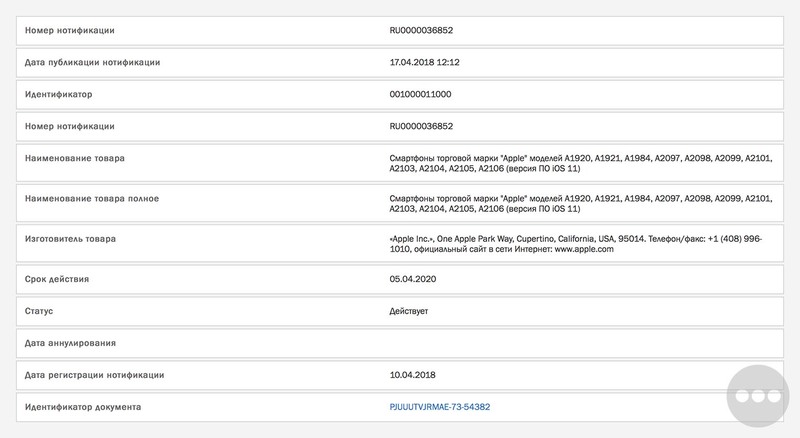 Considering the EEC site’s track record of listing new model number about a month before iPhone releases, we can safely assume none of this relates to Apple’s upcoming flagship iPhones, which aren’t likely to debut until September. That leaves the next-generation iPhone SE, which has been rumored on multiple occasions to be launching in the first half of 2018. Often referred to as the “iPhone SE 2,” the new model will likely look a great deal like Apple’s current iPhone SE, but it’ll feature upgraded internal components to modernize the phone and help improve performance. It could sport the brand new design we saw leak on video and in sketches back in March, but our sources have since suggested that’s unlikely. Whatever the case, it’s looking more and more like the mystery will be solved very soon, with a launch that could happen in May or early June at WWDC 2018.